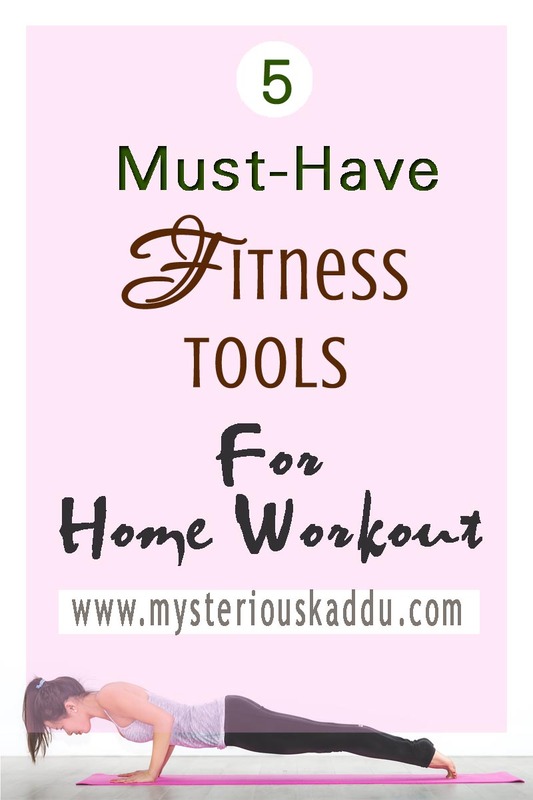 Why on earth would you need fitness tools for home workout when you can easily go to a gym? Well, not everyone likes to go to the gym for working out. For some, the distance and commute could be a problem. Some others might not feel comfortable shelling out the extra money every month on a fitness program at a gym. And then there are always some who just don't like working out at the gym! I have a full-fledged gym in my apartment society. It is completely free to use for the residents. Still, I don't like using it. Ever since I moved to this place in 2011, I have tried so many times to start going to that gym regularly, but, nope. I just can't do it for more than a couple of days. The gym in my society is poorly maintained. It has poor ventilation and gets real stuffy. We can use it only for fixed timings during the day, which are not convenient for me. I keep running into people I know, and I know mostly everyone, being a neighborhood shop-owner! So the social-interactions become unavoidable and distracting. I hate the music they play. Plus, it is too loud. That is why, I prefer to workout at home. There is a lot you can do at home for fitness, without investing in heavy exercise machines or even treadmills. You can design your own home workout program with any combination of simple warm up P.T. (like we did in school), aerobics, yoga (including Surya Namaskar, which is exceptionally good for the back if you work long hours at the computer), light weights, calisthenics, dancing, skipping. You can mix & match from the above and keep it interesting. 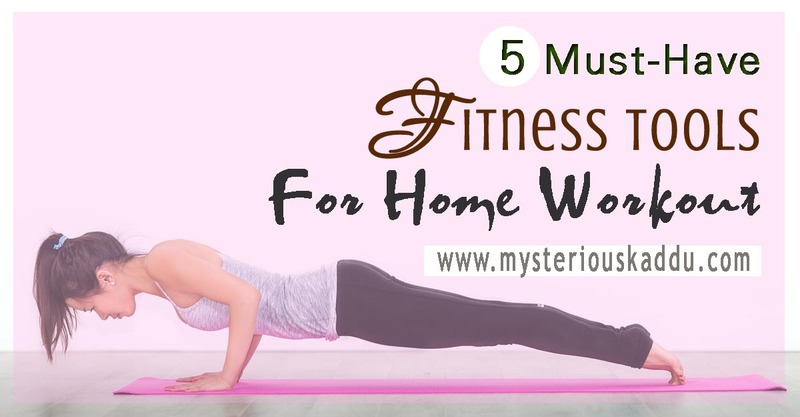 Based on my personal experience, I will highly recommend the following 5 fitness tools to complement and assist in your home workout program. It really helps to be able to monitor your weight regularly at home. Hands down, this Health Sense PS 126 Digital Personal Body Weight Bathroom Scale is the one to go for. Both me and my sister (in Delhi) have the exact same model, and we've been using them without any issues for years now. There are so many yoga mats available these days, and some really cheap ones too, that making a choice was difficult and confusing for me initially. Then I happened to attend an aerobics class in my building and had to borrow someone's extra mat. That helped me figure out what to look for when buying a yoga mat. It should be anti-skid/anti-slip, i.e. the mat should not slip on the floor, and your hands and feet should not slip on the mat. It should be thick enough to provide enough cushion to your body. This Bold Fit Pro-Grip 6mm all-purpose Yoga Mat for men and women from Amazon is highly recommended. Though it seems to be among the pricier yoga mats on amazon, it not only meets the above requirements, but is also tear-resistant and eco-friendly. Plus, it is a full 6 feet by 2 feet. You can check out its full specifications and reviews on the link above. There are a lot of cheap PVC Vinyl dumbbell sets on amazon for women, but I realized they're mostly filled with sand or some such. Not very lasting. I like to buy things once and use them for years. So I zeroed-in on Aurion Set of 2 Chrome Dumbbell with Soft Padded Cushion Handles. They are sleek and have cushion grips so you don't need to wear gloves. But then a young relative, who is heavily into gymming and working out, advised me to go for rubber-coated ones, as I was a beginner and there was a risk of damaging the floor in case I dropped the dumbbells. So we settled on the Cockatoo Hexa Steel Dumbbell Set. You can check out both on amazon. Both have average rating above 4.5 out of 5. And both have multiple size options. During my personal training, I realized I had very weak ankles and shins. So, instead of walking and putting my entire 70+ kg body weight on them, I decided to do raised leg rotation exercises while lying down. And ankle weights can add extra resistance to this exercise routine, helping to build the required muscle strength. I recommend the Cosco Ankle Weight. I chose them because, out of all the innumerable ankle weights available on amazon, these had the maximum number of ratings (in several hundreds), AND still had average rating of 4+ out of 5. These ankle weights are made of comfortable material that does not abrase your skin. And you can wear them on your wrists too if they fit. Of course, they are filled with metal sand, so sometimes, the distribution can be a bit uneven, which you'll need to flatten out. So my sister swears by Fitbit. She has been using one for several years now, and is totally happy with it. Her model is most likely not available anymore, but it is kind of an older version of the Fitbit Alta HR, which has got an activity tracker, sleep tracker, continuous heart-rate monitor, call & notification alert, idle alert, and battery life up to 7 days. But it is pricey. Over INR 10K. The design is really sleek though. But if you really must have the heart-rate monitor too, you can go for the new Mi Band 3. Note that if you keep the heart-rate monitor on, the battery life will go down to about a week. Well, all these activity trackers are good, in that they not only have the pedometer functionality, but also track your sleep and can automatically identify some types of activity. So, depending on your budget and features required, (and the look too, of course!) you can choose one. Check out their detailed reviews on amazon, and have a look at the questions other users have asked. These are my 5 Must-Have Fitness Tools for Home Workout. You can buy and use many other fitness tools at home. If you have the resources and the space, you can even own a personal home gym. But I'm still at the beginners' level. So I wrote this article from that point of view. Too many things at once, right at the beginning, can be overwhelming. That's why I'm recommending only the most basic and most essential fitness products for working out at home. Which of these fitness tools do you use for home workout? What other fitness products do you recommend? This is my sixth post for A to Z 2019. This is quite a helpful posts for people like me who have a love hate relationship with exercise. I own a treadmill that's mostly used to hand clothes of late but I guess your post is a wake up call to start using it asap. I walk every morn and evening in the park. Outdoors help me to get fresh air. Yoga and aerobics keep me fit, flexible and help my blood-sugar regulate. at times I ditch the elevator and take to the stairs. I wish to buy a Fitness Tracker. let me check on Amazon. Simple and useful recommendations and economical too! I work out at home. Previously I was goiNg for classes. You need a tub full of commitment to do it all by yourself though. Thanks for connecting. Happy writing and reading friend! These are great tips for fitness enthusiasts and people with time crunch to get in shape at home itself. Thanks for sharing such easy ways to loose weight. I admire anybody who can keep up a fitness regime such as these tools demand. Me? A brisk walk every day whatever the weather. It allows me to exercise, think, plan and enjoy nature all at once! Good, good! I've been meaning to buy a weighing scale for the longest time and have not gotten around to it. I've donated scales to schools but for myself...sigh. I used waterbottles for weight :-) We have a nice gym near our place but I am too lazy to go there and find it more flexible to workout at home and walk outdoors. Good post, Chicky! Even I do not like to go to Gym. I prefer exercising/ doing yoga at home or taking a walk in the park. I recently bought a weighing machine to monitor my weight during pregnancy and I guess in future I can use it for getting back in shape. People who monitor their weight are less likely to gain unhealthy pounds - so I have read. That's a comprehensive and useful list. I'm probably going to replace my yoga mat with the one you recommended because my cat has sharpened his claws on mine and shredded it.